The World Financial Crisis, Threefold Social Order and Rudolf Steiner's „Organic System of Money“ We have been having a world financial crisis since at least 2008, and it still prevails. We haven't had a collapse like in 1929, because government action and steadily rising debt have allowed us to carry on with „business as usual“ for the moment. This might continue for a while, but no one has gotten to the root of the problem; we're not even looking for it. „Threefold Social Order“ is a radically new approach to the Social Organism, and it also entails a radical solution for the current crisis. Threefold Social Order was first propagated by Rudolf Steiner in 1917. Its political implementation failed in 1919, and there hasn't been a further chance for this since. The movement was continued in the form of the first Free Waldorf School, which was founded in 1919 in Stuttgart, Germany, as a „germinating seed for a free Life of the Spirit“. A superficial solution is no solution. In order to avoid that, we must delve down to the „basic principles“ of the Social Organism. In this essay I will attempt to sketch their content, as a basis for a solution of the financial crisis. This content can be studied more deeply in the book „The Central Issues of the Social Question, in Relation to the Necessities of the Present and Future Life of the Social Organism" (GA 23); and in the lecture series „World Economy“ (GA 341); both authored by Rudolf Steiner. The first important point is that the solution of the crisis cannot be found in the economy (the „Economic Life“ - Wirtschaftsleben) alone! The Social Organism has a polar structure: the two opposite poles are the Economic Life, which produces the commodities, and the Life of the Spirit (Geistesleben), which produces „ideas“, for example, but which doesn't produce commodities. That means that the Life of the Spirit, from an economic point of view, is a pure consumer. The Life of Law and Politics (Rechtsleben) mediates between the two: if it functions properly, that is, if it is strong and independent, it limits the Economic Life and protects the Life of the Spirit. 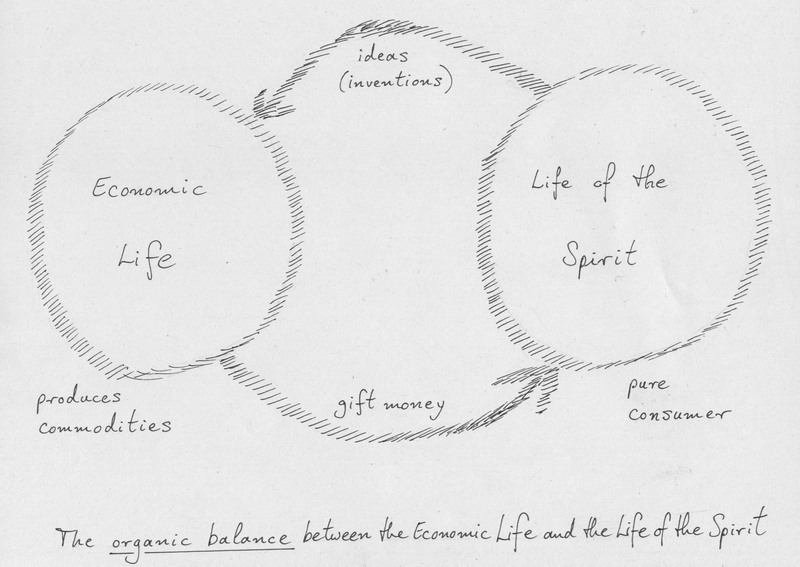 The Social Organism is only healthy if there is an organic balance between the Economic Life and the Life of the Spirit. From this already you can see that permanent economic growth cannot lead to a condition of health. And the exponential growth of debt is an urgent sign of alarm! How can we achieve this balance? The basic situation today is that the Economic Life is much too powerful - it determines the whole Social Organism - and the Life of the Spirit is much too weak. Since the beginning of the Industrial Revolution about 250 years ago, the production side of the Economic Life has been a fantastic success story! The one factor of the economy which has continually increased, year after year, is productivity! Every year the commodities have been produced better and better, more and more economically, requiring less and less labour. That is really a blessing for mankind! However, our problem is on the other side: who is to consume what has been produced? How can consumption grow just as quickly? For producing without the possibility of consuming is senseless, and of course also uneconomical! For this reason we have a crisis of overproduction today in Germany, and at the same time many needy people, who need to consume more, and are not able to. If we look at all of mankind - and we do have a world economy today - this problem is greatly aggravated, especially in the relationship between the First and the Third World. But economically speaking it is only „healthy“ to grant people incomes if they create something of value for the Social Organism. And at this point we find an essential element of a solution in Steiner's thought: Where has this rise in economic productivity come from in the last 250 years? It has come from inventions, rationalisation, division of labour .... it's come from ideas. It's been the Life of the Spirit that has caused this great growth of value! We must recognize that the Life of the Spirit does not produce commodities in the present; but it lays the groundwork so that in the future commodities can be produced. This is also confirmed if you look at schools: today they educate the young generation; in 30 years' time these children will have become the future workers and managers of the Economic Life. A doctor is another example: if he efficiently cures a sick person today, he allows him to return to productive work all the faster tomorrow. Steiner states this in his theory of value creation: there is not only Value 1, which is created when a piece of nature is changed by human labour (this is the only kind of value creation that Karl Marx knows of); there is also Value 2, „spirit applied to labour“, by which labour is saved. This is the essence of the Industrial Revolution. (In my opinion that is also the reason why Steiner never says that he is against „capitalists“: they create Value 2!). When we have recognized this, then we really know what the task is: what measures must we take in order to „pay“ the Life of the Spirit adequately? How much is „adequate“? And who comprises the Life of the Spirit? If we manage to create this organic balance, then we will have created the possibility of consumption for the continually increasing production. a) buying money: this money is the counterpart to the commodity, it's its representative; it is traded to gain the commodity. b) lending money: this money is created with every new economic investment. The economic improvement which it entails allows the money to be paid back, with interest. Lending money indicates that the Life of the Spirit has created new value in the Economic Life. c) gift money: this is for Steiner a purely technical expression, with no moral connotations: it simply means „money which is given without receiving a commodity for it“. This money is a necessity in every economy. On the one hand it is needed for all people who are not able to produce commodities: children, pensioners, sick people, people who cannot work. On the other hand it is needed for all people who create something which is of social value, but which is not a commodity: philosophers, artists, scientists, people who are active in the fields of religion, education, health, etc. How much gift money is justified for the Life of the Spirit? There is an organic criterion to answer this question: since every transaction involving lending money expresses the fact that the Life of the Spirit has created value in the Economic Life, the sum of all investments must flow again to the Life of the Spirit. This will enable the Life of the Spirit to maintain the productivity of the Economic Life in the future. How can we bring this about? Nobody wants to part with his money „for nothing“! Here Steiner suggests a change in the money system. He draws our attention to the fact that it is not realistic to allow money to keep its value indefinitely, while the commodity which it represents at some point in time is consumed or spoils. That is why it is justified to give money a date of expiry. In this way we create „young“ and „old“ money. And when the money has aged enough, that is, when it has reached its date of expiry, it can be revalued: but only for the Life of the Spirit! This is a suggestion to overcome egotism in relation to money. One could maybe also find a different solution. But the main point is to recognize the organic connection, that the increase in economic productivity must be offset by an equal increase in the financing of the Life of the Spirit. The next question is: where should this money flow to? Who is entitled to receive this institutionalized gift money? The inventors, the managers (who form a part of the Life of the Spirit) are usually very handsomely remunerated already. The universities receive abundant „third-party funds“ if they do research which has useful applications in the economy. Here a basic renewal through the Threefold Social Order comes to bear. This Threefold Social Order will only have been realized, and can only cure the social organism, if each of the three areas, or members (Glieder) is constituted in complete independence, governs itself, and forms an independent centre of decision; the three members should deal with each other like „sovereign states“, says Steiner. Today we don't yet have this self-government of the free Life of the Spirit. There exists, in Steiner's words, a „half-free Life of the Spirit“, which is oriented towards improving the Economic Life; and there is also the „completely free Life of the Spirit“, like the worlds of art, science, religion and education. Both belong together. The half-free Life of the Spirit, with all of its economic improvements, is connected - and this is something which, Steiner says, one can only recognize through careful, intimate observation - by „a thousand threads“ with the completely free Life of the Spirit. In the world of the spirit everything is connected to everything else: on a thousand hidden paths the half-free Life of the Spirit receives inspiration from that which is being dealt with in the philosophy, poetry, science and art of any given society. A favorite example of Steiner's is infinitesimal calculus, which was first discovered as an element of pure mathematics by G.W. Leibniz. Since then, technical progress has resulted in the necessity to use this calculus every time a tunnel is built. So really it would be fitting, every time a tunnel is built, to give some financial remuneration to Leibniz, or to his heirs! That is of course not reasonable; but it is reasonable to remunerate the general Life of the Spirit, so that new Leibnizes can do their work! Half-free Life of the Spirit and completely free Life of the Spirit therefore belong together under the one self-government of the unified Life of the Spirit. This self-government will decide to where the institutionalized gift money is to be allocated. A free Life of the Spirit administration will hardly lack the insight that its completely free branch must also be appropriately remunerated. The investigation of the financial crisis has mainly pointed to necessary changes relating to the Life of the Spirit. That is justified, for today this is the area of the social organism which is vastly under- supplied. It has hopefully become clear how a true liberation of the Life of the Spirit will lead to a fitting solution for the whole social organism, including the economic and financial problems. Huge masses of money are galavanting around the „financial markets“ today, with little connection to the realities of the Economic Life. In order to tame and transform them, we will also have to take measures in the Economic Life and in the Life of Law and Politics: for example, transform private ownership of the means of production (which is the basis of share ownership and the stock exchange; this is where we must still learn from Karl Marx) – or, generally speaking, abolish the purchasability of nature, labor and capital, the three factors of production. By transforming these three into commodities, the Economic Life usurps great areas of the social organism in a pathogenic way, thereby encouraging a ruthlessly anti-social striving for profit. That is why the attac movement has the slogan: The world is not for sale! It is not much translated yet - who can translate a basic text from here: www.dreigliederung.de to here: www.threefolding.org?